According to the forward to his monumental book series The North American Indians, Edward S. Curtis is a man “whose pictures are pictures, not merely photographs.” One wonders now what is meant by that statement, written in 1907 by President Theodore Roosevelt. But if you spend enough time in the Taft Museum of Art’s new exhibit, Enduring Spirit, you might understand the difference between a picture and a photograph. Curtis, who was until somewhat recently primarily remembered as an ethnologist rather than a photographer, spent years on the American frontiers creating a visual and written catalogue of Native Americans. The twenty-four year undertaking—originally to take five years and commissioned by J.P. Morgan for $75,000—was to create a 20 volume series comprised of 1,500 photos. Although he was never paid, his life became consumed by the project, which strained his expenses, his body and his relationships. It was an endeavor of artistry, documentation and morality, as Curtis felt obligated to record as much Native American tradition as possible before the culture tumbled into oblivion. Curtis himself faded into relative anonymity until his death in 1952, and then still until the ’70s, when his legacy was renewed, perhaps in part due to ethical issues surrounding American Indians. 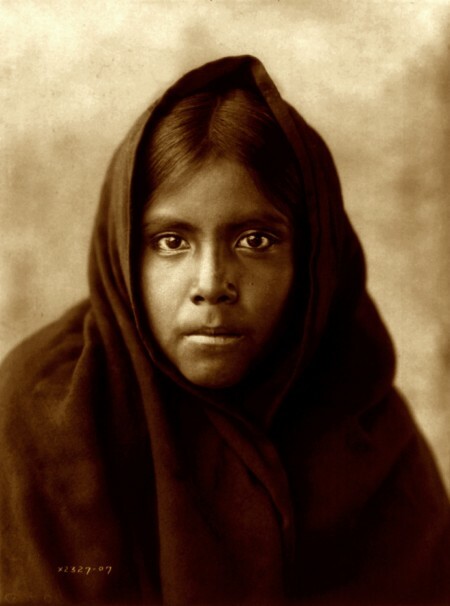 Edward S. Curtis, “Qahatika Girl,” c. 1907, photogravure. Enduring Spirit divides its photographs by geography rather than chronologically. The Great Plains, the Southwest, the Plateau and the Northwest Coast each possess their own sections, allowing gallery visitors to notice the contrast between attire and ritual of different Native American tribes. Among the portraits, landscapes and tableaux displayed, the portraits stand out the most. Curtis’s painterly approach toward photography and a gift for capturing his sitters with a deep empathy makes them resonate. Of course, as an ethnographer, the troubling aspect of his body of work stems from his inabilities to divert his romantic gaze toward otherness. Curtis staged ceremonies and interactions, doctored photos to omit modernity and often supplied his subjects with costumes and regalia. 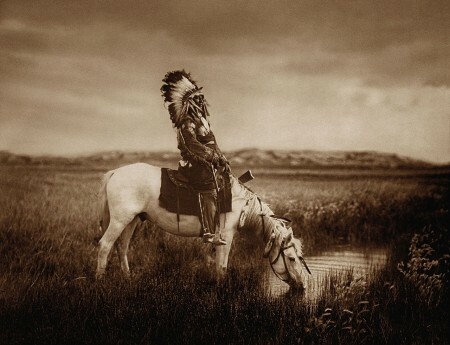 Such, perhaps, is the price of timelessness—according to the exhibit’s text, Curtis’s photos reverberate within the soul of American Indians because of their nobility and dignified aesthetic. * But by firmly preserving the “Indian-ness” of Native Americans and erasing or avoiding evidence of Western displacement and influence, Curtis has challenged Roosevelt’s assertion that his work “has far more than mere accuracy, because it is truthful.” Is truth more important than accuracy, and are Curtis’s works truthful? It is almost impossible to stare at his portraits, at the soulful (if carefully positioned) faces, and not see a semblance of authenticity. But Curtis has captured Native Americans purely in the past tense, almost implying obsolescence in the impetus of his very project. This, and the storyline of a disappearing Native American ethnicity in general, is important to contemplate while witnessing Curtis’s depictions. That is not to say his photographs are not works of art—they are, and breathtakingly so. In “At the Old Well of Acoma,” one of Curtis’s most popular images, an Acoma girl leans down to fill a vessel with water from a pool on a New Mexico mesa while another watches. The composition of the photo is pristine. Rings of water are sent from the girl’s movements, her body caught in the well’s reflection. Although there is a lyrical sense of motion, there is something eternal about it, and even more so when discovering that the pueblo is still inhabited by indigenous peoples, and is the oldest continuously inhabited place in America. Enduring Spirit concerns itself with the extreme innovations Curtis made in the photographic medium as well, including the unique exposure techniques he developed, quite literally, under the conditions of his strenuous journeys. Photogravures, platinum prints, goldtones and a cyanotype are displayed along with diary excerpts and original pages from The North American Indian. Edward S. Curtis, “An Oasis in the Badlands,” c. 1905, lithograph. 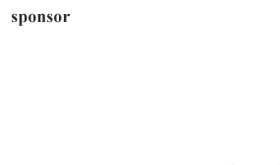 Frequently, Curtis’s portraits eschew trope for compassion. Unlike how many settlers saw them, Curtis undeniably was able to portray American Indians as human beings rather than characters or the uncivilized “savages” whites considered them. Each face presented in the gallery invites you to not simply look, but to understand. Perhaps one of the most mesmerizing portraits is of Chief Joseph, a highly respected leader of the Nez Pierce tribe in Oregon. Chief Joseph suffered innumerable hardships, fought countless wars and spent his life in constant upheaval surrounding his homeland. Known for his famous “I will fight no more forever” speech, he forged a friendship with Curtis that helped the photographer be included in countless Native American circles, where he learned ceremonies and traditions that otherwise may have gone undocumented, like the Hopi “Snake Dance.” Curtis took two portraits of Chief Joseph; one with full regalia—complete with a plumage of white headdress and a hard squint—and one without. In the latter, a goldtone print, Chief Joseph’s hair is held up in a swoop, white discs of shell hanging from his ears. This photograph represents the inspiring abilities of Curtis as an artist and documenter, and lets us celebrate the split second when the shutter decided that the subjects no longer became merely subjects, but forever alive with that human alloy of vulnerability and integrity. Curtis’s landscapes celebrate the natural earth that whites confiscated from indigenous tribes. Taken with a 14 x 17-inch view camera—the same that Ansel Adams used—Curtis’s shots favor minimal composition and skillful depth of field. His picturesque scenes hold silhouettes against stark canyons, the bold permanence of vast tablelands, noble chiefs on horseback amid gravid skies. Often, his images troublingly resemble postcards instead of bringing attention to the very real plights American Indians were facing. “The Indians, as a race, already shorn of their tribal strength and stripped of their primitive dress, are passing into the darkness of an unknown future,” Curtis wrote in 1904. But rather than describing with his lens the troubles Native peoples were going through, he sought to preserve a culture that had in many ways already changed. In this way, Curtis should not always be thought of as a true documenter, but a kind of preserver of American Indians before interaction with other cultures; Curtis was interested in creating an encyclopedic continuum for depictions of what he considered “Indian” to exist in. That being said, some of the over 80 tribes Curtis interacted with had never before seen a white man, and so these photographs survive as what could probably be considered a more authentic vision of tribe members pre-acculturation, despite Curtis’s known habits to stage and alter his photos. This tendency is a product of Pictorialism, a photography movement that Curtis helped form. Its style can be seen in work that is touched up by the photographer in order to distill a mood rather than record a happening. And so Curtis’s oeuvre, with all of its sumptuous atmosphere and tone, consists of creations rather than pure history. The magic of Curtis’s compositions is just that—it can be true and a lie at the same time. And like magic, it can be believed or untrusted. Enduring Spirit itself is expertly curated and explains Curtis’s contributions to the photographic process understandably. It can’t in earnest be called a retrospective—his over 50,000 photographs, many of them lost, make it hard to form an exhaustive display—but the show will leave viewers with a profound impression of Curtis’s legacy to art and history. It also might leave you with stimulating questions: how do anthropologists “preserve” cultures today? Have Native American cultures vanished, and in whose eyes? Have Curtis’s images and productions given us a harmful perception of indigenous peoples, placing them strictly in history and not the future, or do they eternalize the impermanent? How has the Internet changed how we document and produce culture? ** The Taft has scheduled a host of discussions and panel events that will ruminate on these topics, bringing in scholars and curators who specialize in Curtis’s work. One of the photographs, “Kutenai Duck Hunter,” remains unforgettable for me. Taken in 1910, a nomadic member of the Kutenai sits in a canoe twinned in the Flathead Lake, the sepia tones and exposure edited to bring out a rich contrast. The vanishing point, barely visible, is a faint horizon where water meets sky, a reminder of the photographer’s mindset that Native American culture was on the cusp of extinction. It is a remarkable image, melding hope with uncertainty, solitude with loneliness. A photograph cannot do that, but a picture can. Enduring Spirit: The North American Indians is on display through September 20, 2015 at the Taft Museum of Art. **The Native American Indian, which originally only saw 222 copies and did not sell much, is archived in its entirety online now.